"Greetings from Hopewell Valley" was awarded Honorable Mention by our panel of Stampede Judges. Congratulations! 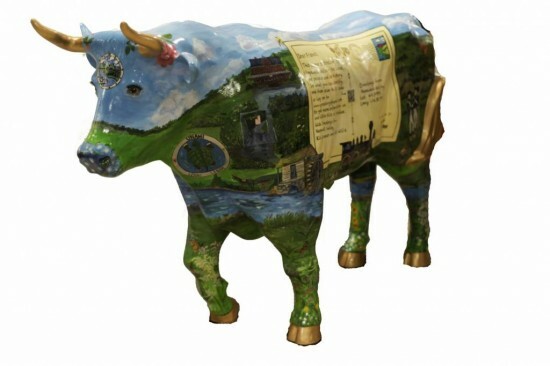 Our Ox is a celebration of Hopewell Valley: farmland, river, people and history. Inspired by vintage postcards, the design has a friendly spirit featuring unique Hopewell Valley images. There’s a QR code in the middle of the letter side of the postcard; scan it and it takes you to our website ‘greetingsfromhv.com’. Our website includes the stories behind the pictures – for example, why is the railroad important to the development of Hopewell Valley? What is the Frog War? And who are the Lenni Lenape and where were their settlements? As artists and teachers, we think this design is a great way to share our enthusiasm for this wonderful place where we live, and to share the stories of the people and places that make our Valley unique and cherished.